By far my favorite summer treat is a root beer float. The combination of smooth, creamy ice cream and sweet, fizzy soda is divine. Most Sunday evenings during the summer, we go out for ice cream, but lately, we are beat after long days at the pool. Rather than go out, we've been opting to stay in and make our own root beer floats. 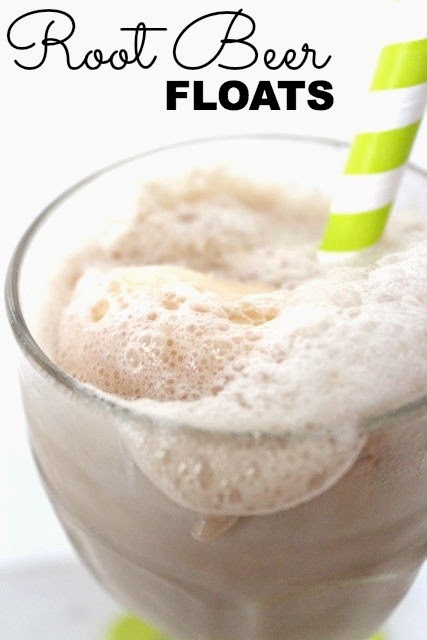 This recipe is a variation of the traditional one and makes for a smoother, creamier root beer float. 1. In a blender, combine 2 scoops ice cream and 3/4 cup root beer. Blend until mixture is smooth. 2. Add a scoop of ice cream to each glass. Fill with blended ice cream/root beer mixture. Top off with a splash of root beer.